she fancies a good rummage for antique silver "ware" from tea spoons to tea pots. And because I'm such a huge fan of all things tea, her recycled beauties quickly caught my eye. or this one, which is MINE now! 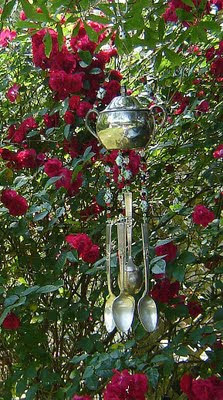 A sugar bowl ~just the right compliment to the spoon chimes, because when a little breeze "stirs", there's "sweet" sound! I will be more content to enjoy the beauty of its form and song just outside my lace draped picture window. Can you see it? Used items revamped for practical use and our enjoyment ~ these are among my favorite things. 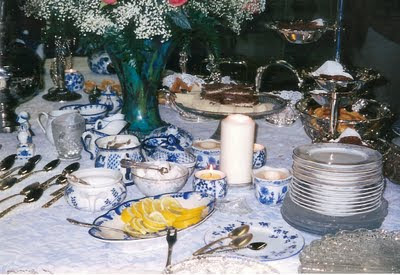 ...And a Proper Tea Party! So lovely.... and such a great way to repurpose items no longer used.... love the sound of wind chimes! Those wind chimes are soooo creative and just gorgeous!! I love it by your rose bush too!! Holy Moly I want one! They are really lovely!